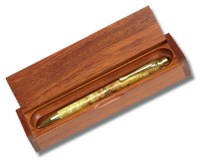 Each pen is made of handcrafted wood or an acrylic material and comes cradled in its own finished wood display box. They are individually made for you with personal care and great attention to detail. Whether you prefer a fountain pen or a roller ball pen, the quality is the same. The solid weight and feel of the pen in your hand is such that you will intuitively know that you are in possession of a high-quality writing instrument. Whether you are a true connoisseur of the lost art of writing by hand, or you simply love quality, you will find that one of these pens is just right for you. All pens offered by Pendulum and Pen Ink are finished to a durable, high gloss by sanding with 150 grit to 12,000 grit sand paper. At this point, the acrylic pens are complete but the wood pens require a few additional steps. Eight layers of finish are applied and then the sanding process begins again bringing it to its final lustrous, high gloss-finish. This process offers an end result different from a pen with a friction polish found on lesser quality pens. A liquid polish has a dull look and feel, and picks skin oils, therefore darkening with age. A high-gloss finish provides an aesthetic quality that shows throughout the life of your pen. This finish maintains the beauty and integrity of your pen, thus preventing it from darkening with use. The pens have a high-grade, rhodium plating, like chrome, on its exterior metal parts. Rhodium is a member of the platinum family and it is used because it will resist scratches and does not tarnish or discolor, adding to the pen’s long life. Each pen has either a hand-cast black titanium or 22k gold inserts. This material details the top of the cap, the band, and the end cap, making this a collector-grade pen of distinction and unrivaled beauty. The threads of the pens match up nicely and turn with ease. Each pen has a post-able cap, which means that it will screw on to the threaded end cap of the pen. This feature keeps the cap with the pen, so you do not have to worry about setting it down and losing it. Also, posting the cap on the pen adds to the pen's solid feel. That said, the weight of the pen is just as comfortable to use without the cap posted on the pen, so try writing with it that way as well. Each person's hand is unique based on their own individual writing preference. I place a high-quality cartridge inside each pen. The fountain pen uses a German-made two-tone iridium point nib, and comes with a Schmidt ink cartridge and an ink converter. This gives the fountain pen user the option of using a standard fountain pen cartridge or refilling the converter with an array of quality fountain pen inks. The rollerball pen uses a Schmidt 5888 fine-tip cartridge with ceramic-tipped roller ball nib, using gel ink and incorporating a safety system that prevents the ink from drying out in the cartridge. This German-made cartridge is found only in fine writing instruments. The cartridge is a standard size and when empty, can be replaced with a refill cartridge from most office supply stores. However, such a fine pen deserves to maintain its smooth-flowing writing capability, so if I may suggest, replace your cartridge with another Schmidt 5888 cartridge. I sell these cartridges at a very reasonable price, as I believe they are some of the finest cartridges made. And, I believe that your pen deserves the very best.